We are pleased to inform you, that the journal Titian Ilmu: Jurnal Ilmiah Multi Sciences has become a journal accredited by the Ministry of Research, Technology and Higher Education based on Number SK 30/E/KPT/2018 about the Results of Scientific Journal Accreditation in Period 2 of 2018. Volume 9 Number 1 Year 2017 to Volume 13 Number 2 Year 2021. 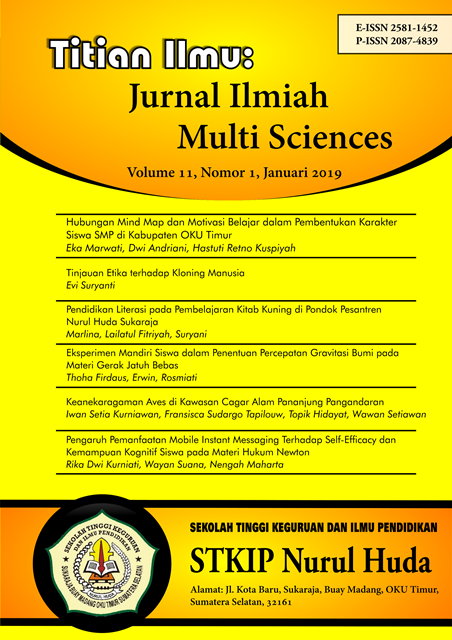 Titian Ilmu: Jurnal Ilmiah Multi Sciences is a scientific journal published with a view to facilitating academics and researchers to publish their research results in the field of EDUCATION AND MULTI SCIENCE. This journal has E-ISSN 2581-1452 and P-ISSN 2087-4839. This journal is Open Access and can be downloaded for free. Titian Ilmu: Jurnal Ilmiah Multi Sciences has been accredited with the ranked 4 by the Ministry of National Education of Republic of Indonesia with Keputusan Direktur Jenderal Pendidikan Tinggi No. 30/E/KPT/2018. Accreditation is valid for 5 (five) years, namely: Volume 9 Number 1 Year 2017 to Volume 13 Number 2 Year 2021. Interested in submitting to this journal? We recommend that you review the About the Journal page, as well as the Author Guidelines. Authors need to register with the journal prior to submitting or, if already registered, can simply log in and begin the five-step process.